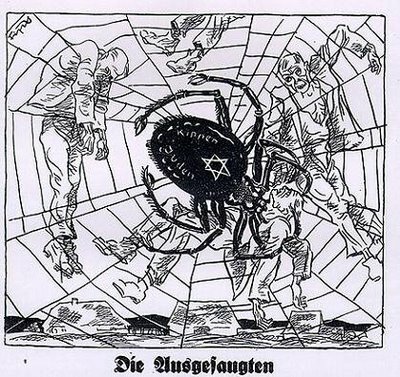 An anti-Semitic Nazi cartoon depicting Jews as a malevolent spider. Nazi anti-Semitism was an intense form of the ‘Jew-hatred’ that infected German politics in the 1800s. Many nationalist politicians and pundits, particularly those who supported the unification of Europe’s German-speaking states, were exponents of anti-Jewish conspiracy theories. One was Wilhelm Marr, a nationalist writer who is credited with coining the term “anti-Semitism”. Marr was not the first German anti-Semite but he was certainly one of the most vocal. In a 1879 pamphlet, he claimed the newly-formed German state was at war with Jews living within its borders – and that one would not survive unless the other was destroyed. Other pamphleteers shared Marr’s beliefs, repeating stories of a mysterious Jewish conspiracy to sabotage the new nation. German-Jews served as a ready-made scapegoat for these ultra-nationalists. Almost any political failure could be attributed to the ‘international Jew’ and his unseen interference, despite a lack of evidence. 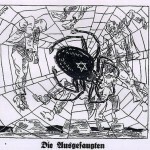 Anti-Semitic conspiracies persisted in Germany during and after World War I. Jews were regularly blamed for sabotaging the war effort – despite the fact that more than 100,000 Jews served in the German military during the conflict. The infamous Dolchstosslegende (or ‘stab in the back legend’) provided another avenue for anti-Semitism, nationalists and military veterans claiming that Germany’s surrender to the Allies in November 1918 was engineered by socialists and Jews within the government. This anti-Jewish scapegoatism continued to fester during the desperate 1920s. Most right-wing political groups of the Weimar era, such as the German National People’s Party (DNVP), harboured at least a small quota of anti-Semites or anti-Semitic ideas. For the most part, these groups kept their anti-Semitism in check. The DNVP, for example, restrained or expelled several of its most vociferous ‘Jew haters’. There were, however, more radical parties where anti-Semitism was tolerated. One was the Nationalsozialistische Deutsche Arbeiterpartei (NSDAP, or National Socialist German Workers’ Party – better known to history as the Nazi Party). The NSDAP sprung from humble beginnings, formed in 1919 as the Deutsche Arbeitpartei (DAP, or German Workers’ Party). Its founding members were insignificant men who all intense nationalists who accepted the Dolchstosselegend and other conspiracy theories, some of them with anti-Semitism at their core. The DAP’s few dozen members met each week to swill beer and curse the same targets: the new Weimar government, the Versailles treaty, other European nations and the alleged political, financial and cultural influence of Jews in Germany. All this would have amounted to little if not for the arrival of a new member. In September 1919 Adolf Hitler, an army corporal, was sent to spy on the DAP – but while attending its meetings he became enthralled by the group’s political rhetoric. Through 1920 Hitler began to exert more influence over the DAP, chiefly through his passionate and forceful public speaking. The group reinvented itself as the Nationalsozialistische Deutsche Arbeiterpartei (NSDAP, or National Socialist German Workers’ Party). It also achieved steady growth, attracting around 2,000 people to a rally in February 1920. By the end of the year, the NSDAP membership was 3,000 and growing. A sizeable proportion of these new members were hardline anti-Semites, drawn to the NSDAP by Hitler’s own obsession with Jewish conspiracy theories. 1. Anti-Semitism was prevalent in Germany during the 19th century, perpetuated by nationalist politicians and writers. 2. Anti-Jewish conspiracies also flourished during and after World War I as Jews were blamed for Germany’s surrender. 3. Anti-Semites were well represented in post-war political groups, particularly those on the far Right like the NSDAP. 5. Hitler preferred what he called ‘rational anti-Semitism’: a prolonged and organised campaign to extract Jews from German public life.